From Pike St, Right on Front St, Left on Clements View Dr, Left on Sullivans Ridge Dr, Immediate Right on Sullivans Ridge Dr, House on the left. Ready for your own slice of paradise? You most definitely can in this beautiful home in the Woodlands of Morrow. 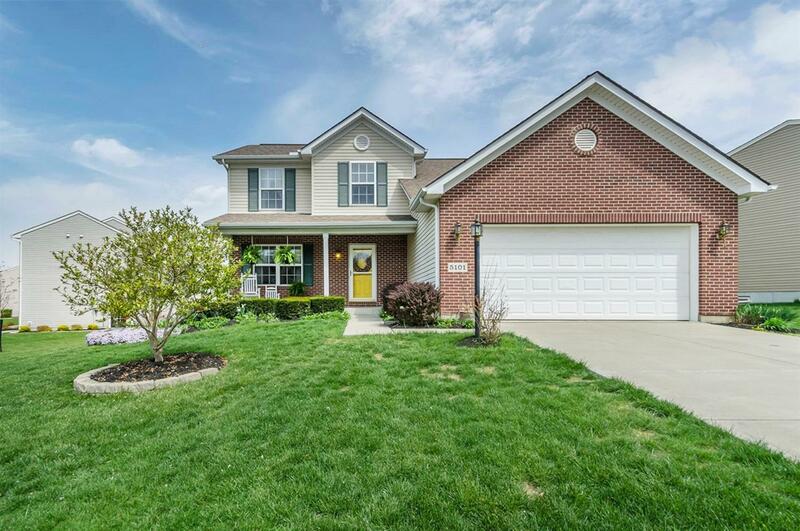 This bright and welcoming updated home has four bedrooms and a two car garage. Plenty of space to entertain whether inside or outside! Enjoy a beverage under the night sky with the extended concrete patio and pergola. Morrow was founded in 1844 by Clement, Keck and Williams (employees of the Little Miami Railroad) when the railroad was extended to the mouth of Todd Fork Creek. It was named after Governor Jeremiah Morrow, the ninth governor of Ohio and president of the Little Miami Railroad. The village has now 1,200 residents. Old and new, there are all kinds of home available in Morrow in all prices ranges. Some homes are situated on land while others are located in subdivision communities. Morrow is located at the intersection of U.S. 22 and State Route 123, about five minutes east of I-71. Downtown Cincinnati is about 40 minutes away and Lebanon is less than 15 minutes to the west. The Lebanon-Warren County Airport is north of Lebanon. The Dayton International Airport is located to the north and the Cincinnati Northern Kentucky International Airport is to the south. Local merchants provide daily necessities. Larger shopping facilities can be found in nearby Lebanon, Landen and Symmes Township. West Chester and Deerfield Township offer many stores and shopping centers. Local merchants provide daily necessities. Larger shopping facilities can be found in nearby Lebanon, Landen and Symmes Township. Nestled in the Little Miami River Valley, Morrow offers a number of outdoor recreation opportunities. The Little Miami River is a designated state and national scenic river that offers canoeing, kayaking and fishing in the most beautiful setting in southwestern Ohio. Many canoe liveries operate in the area. The Little Miami Scenic Trail is a 60-mile paved multi-purpose pathway through southwest Ohio that offers year-round exercise, excitement and outdoor adventure. In Morrow, the Jeffery Phegley Memorial Park is adjacent to the trail. The park offers children’s amusements and picnicking. Whether it’s peddling or paddling, Morrow is the place for great fun. Morrow is home to the Valley Vineyards, host of an annual fall wine-tasting festival. The Bel-Wood Country Club and Whitacre Oak Hill golf course are nearby. The Little Miami Bike Trail, a former railway that has been converted to a multi-use trail that runs between Milford at its southern terminus and Yellow Springs at the northern end, winds through the area along the river. Fort Ancient is nearby and is a national historic landmark. This listing courtesy of Tyler Smith (513) 293-8971, RE/MAX Preferred Group 513-229-7774.